Join in the FOOD REVOLUTION TODAY! It’s a big day for all of us who believe in bringing back real food and real cooking. Especially Jamie Oliver, who believes so strongly that he has used his star status and success to organize a day that is being celebrated not just in Britain but all over the world for the second year in a row. Visit the Food Revolution Day website to find out whats going on today and tune in to Jamie’s Food Tube Channel on YouTube to watch the festivities live. Cook something real, something healthy, something simply good and good for you today to celebrate. Place quinoa in a fine sieve and rinse under cool running water, rubbing the grains with your hand for at least 2 minutes. Drain well. Combine 1/2 cup water or broth and quinoa in a small saucepan; bring to a boil. Cover, reduce heat to low, and simmer 12-15 minutes or until liquid is absorbed and quinoa is tender. Meanwhile, heat a skillet to medium-high. Add the oil and swirl it around to coat pan. Then add the bell pepper, jalapeño, garlic, salt, and pepper to pan; sauté 3-5 minutes to soften the vegetables. Stir the cooked vegetables into the cooked quinoa, then add the tomato, cilantro, and lime juice. Toss gently and pour into a serving bowl. From the look of things, there’s probably snow on the ground where a lot of you are. It’s hard to believe we had a big enough snow here in the South to make a snowman, but it happens on occasion. However, unless you’re from somewhere not too far below the Mason-Dixon Line you might need a lesson on how to build one. I’ll tell you how to make some soup that will warm you to your toes after being out in the frigid air, though. 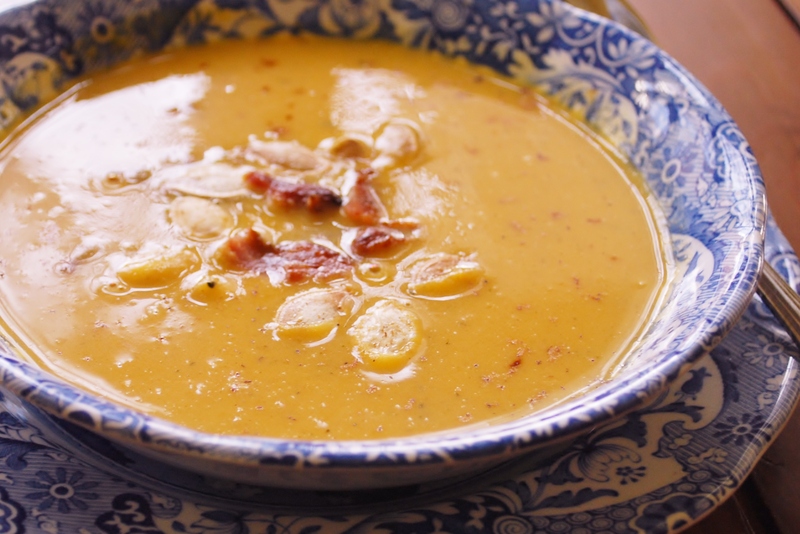 A Butternut Squash and Pumpkin Soup that is flecked with tiny bits of bacon and warmed by a splash of sherry will do the trick nicely. Sprinkle a few toasted pumpkin seeds and bacon pieces on top and you’ll forget all about the snow. Peel squash and cut off top and bottom. Slice lengthwise and scoop out seeds with a spoon. Chop into 2 inch pieces. Repeat with the pumpkin. Pile squash and pumpkin chunks into a baking dish and add 1/2 cup water. Bake about 1 hour until tender when pierced with a knife. Put the bacon pieces in a large pot and turn on the heat to medium-low. Cook until bacon is deep brown and crisp. Remove to a plate, leaving the drippings in the pot. Add the yellow and green onions and the garlic to the pot and sauté over medium heat until softened. Strip the leaves from the thyme sprigs and add them along with the bay leaf, salt, pepper and nutmeg. Stir for about one minute. Add the roasted squash and pumpkin and sauté 5 minutes longer, then add the chicken stock and bring to a simmer. Cook, stirring occasionally, for 20 minutes. Remove the bay leaf from the pot, and puree the soup in a blender, food processor, or with a stick blender until smooth. Return the soup to the pot and bring back to a simmer. Add the sherry and simmer gently for another 3-5 minutes. Pour in the cream and heat through. Add additional salt and pepper if needed. Serve with a sprinkle of nutmeg and top with the reserved bacon pieces. Meatloaf. It’s what’s for dinner. Or so I told my family. They weren’t thrilled at the idea, the husband having flashbacks of dry, tasteless meatloaf, and the children having flashes of television shows where meatloaf is the enemy of child-kind. But the rule is ‘you have to taste it’ at my house, so they did. And guess what, Mikey? They liked it. This Ina Garten recipe for Individual Meat Loaves for this week’s Barefoot Bloggers turned out to be surprisingly delicious. Here’s what I think made the difference: First, you begin with sauteed onions, cooked until soft so they melt into the meat instead of staying crunchy. Secondly, chicken broth is mixed in along with the other ingredients which keeps it from being too dry, like meatloaf sometimes tends to be. Want to hear your husband say “this is the best meatloaf I’ve ever had”? Click here to get the recipe a give it a go. Ahhh, it’s March. I don’t think I’ve ever seen a time when people were more sick of winter. Did you ever think there could be too much snow? And the disastrous things going on with the Earth – I know we are all praying that they will come to an end soon. In my area we have had a cold, wet winter, and though not nearly as bad as other areas, it’s all relative to what you’re used to, I think. Even though March is always a tease – one warm day followed by a week of cold ones – at least there is a light at the end of the tunnel, the tunnel named winter. So today I bring you some sunshine in the form of bright, lemony, and garlic-y Baked Shrimp Scampi. This dish comes from Ina Garten’s Barefoot Contessa Back to Basics, her most recent cookbook. In a fun twist on traditional scampi, the shrimp is briefly marinated and then covered in a butter, herb, and breadcrumb mixture and baked. What you find after baking is a wonderful dish of shrimp scampi with a delicate, crispy topping. Very different and very delicious. From the Barefoot Bloggers February selections, this recipe can be found here. “Women (and some men) who are tired of cooking for those ingrates called children and the occasional spouse, who are weary of cleaning up after meals and bored with eating on a schedule . . . know the pleasure of being alone at last in one’s kitchen. It’s an enjoyable moment when we get to eat whatever and whenever we want – and wherever, too, for that matter”, writes Deborah Madison in her book, written with her husband Patrick McFarlin, What We Eat When We Eat Alone. This basically sums where I am in life related to alone time in the kitchen. Most of my time in the kitchen is spent cooking for others, trying to provide meals that are healthy, that everyone will eat and (mostly) enjoy, and cleaning up the mess afterward. When I find myself alone, cooking for only me, I absolutely relish that time and try to make the most of it. And if this time happens to be on an extremely rare night alone, it will include “more red wine than usual”, as many of the interviewees in Madison’s book confided. In Madison and McFarlin’s book they interviewed anyone they encountered to find out their preferences when faced with eating alone. It was discovered that often people felt that cooking for one was not worth a big production, and as a result people usually threw together a few pantry items, like toast and sardines, crackers and milk, or soup from a can, and called it a night. Others, however, shared some relatively simple but tasty recipes they save for alone times, usually because they are things only they like (kidneys) or they are a little embarrassed to admit to liking them (Frito pie). The authors took many of these recipes and tested them out themselves, finding that indeed they were worthy of preparing, and shared them in the book. A couple I plan to try in my own kitchen – Asparagus with Chopped Egg, Torn Bread, and Mustard Vinaigrette; and Potato Wedges with Red Chile. I spent many years before marriage cooking for one, and I would say the only drawback was having to scale everything down so you didn’t end up eating a whole cake alone, or ending up with gallons of soup to eat for the rest of the year. But being someone who really enjoys cooking and eating good tasting food, I didn’t compromise just because I was the only one eating. And even now when I am alone, if I have a little energy to spare, I will whip up something just for me. Because like one contributor to the book admitted, “Eating alone is nothing less than a luxurious, even decadent, act, because I get to thing about myself. I don’t have to think about someone else.” That could even mean chips and a really good dip for dinner, even, just because I can. Here’s a recipe I might have shared with the authors if asked, an easy but tasty recipe I’ve been making for myself since my school days, called a Turkey Fapita. Deli turkey, onion, Worcestershire or soy sauce, and a pita or tortilla wrap are all you need to make it. Of course it can be embellished with anything else you have on hand, such as peppers, cheese, salsa, a squeeze of lime, etc., but it is perfectly good and filling as is. Heat a skillet over medium heat and spray with cooking spray. Add onion. Cook, stirring occasionally, until soft and lightly browned. Add turkey to pan and stir for one minute. Add sauce(s) to pan and cook another minute. Remove from heat. Warm pita or tortilla (in microwave, skillet, or over stove flame). Put turkey mixture on top and roll up. I have a confession to make. I used to be a football ‘faker’. I would feign interest in football games just to be part of the crowd – clap when everyone clapped, stand up when everyone stood, and yell out things I heard others yell out. My boyfriend was on our college football team, and I had no idea what went on for four years. I feel a little ashamed now, especially knowing the reason for my lack of interest – it all just seemed way too complicated. And if I hadn’t learned the rules before college, well it was simply too late. Since being married to a football fan who is very dedicated to his college team, I have once again found myself attending football games, this time with young kids often in tow. And they ask me questions . . . about football. Well, I can’t have the children growing up in ignorance like their mother did. So I’ve been forced to actually pay attention and figure out what’s going on. I guess it’ll keep my brain young and all, you know, learning something new. And my kids won’t have to fake it either. Now, something I don’t have to fake is cooking up some tasty football snacks. If you’re in need of a warm and spicy dip for the game, this is what you need to put on the table. Sausage, cream cheese, spicy tomatoes and hot sauce melt together to make a delicious dip for corn chips, baguette slices, or crackers. It also tastes just as fabulous with turkey sausage and light cream cheese as it does with the regular stuff. Trust me, there’s no fakin’ the fabulousness of this dip. Cook sausage in a large saucepan over medium heat until no longer pink. Drain and return to pan. Add tomatoes and cream cheese to pan and cook, stirring occasionally until thoroughly blended and heated through. Stir in hot sauce to you liking. Serve warm with corn chips, crackers, or baguette slices.